In 2006, the Ambassador Hotel – site of both the famed Cocoanut Grove nightclub and the 1968 assassination of Senator Robert F. Kennedy – was razed to make room for a new set of six pilot schools to be known as the Robert F. Kennedy Community Schools. 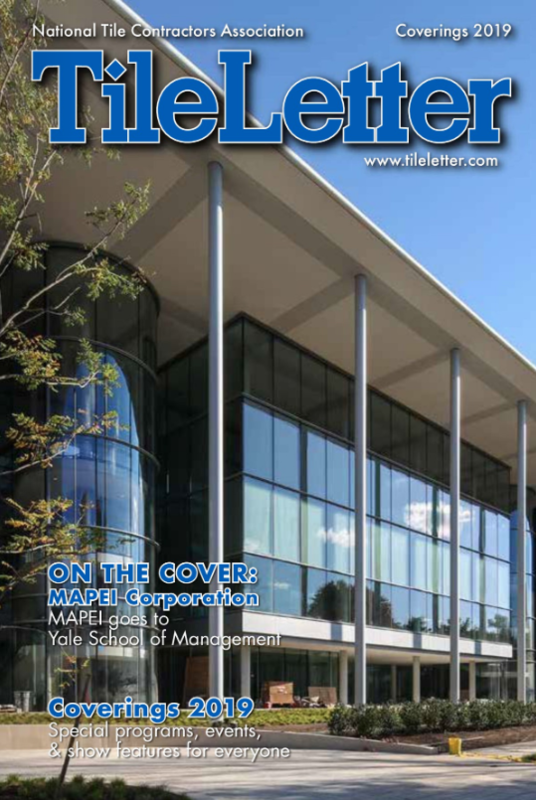 The namesake schools now feature a marble memorial depicting the late Senator Kennedy, a manicured public park, and a state-of-the-art swimming pool, and include the Ambassador School of Global Education, Ambassador School of Global Leadership, NOW Academy, UCLA-CS, School for the Visual Arts and Humanities and Los Angeles High School of the Arts. The schools, which occupy 24 acres, are intended to serve the Pico-Union and Koreatown neighborhoods, with a robust and personalized program that embodies the social justice legacy of the late Senator Kennedy. Four thousand students in grades kindergarten through 12 will be served in this 2011-2012 school year. Artist Lynn Goodpasture (www.LynnGoodpasture.com) was commissioned by Los Angeles Unified School District (LAUSD) to develop an original public artwork for the new schools. She designed the 690 square-foot hexagonal labyrinth as a remembrance of the landmark hotel. The labyrinth, is titled Keeley’s Garden, Labyrinth 1, after Goodpasture’s daughter, who grew up in and around her mom’s studio. The labyrinth is paved with custom-designed French encaustic tiles, derived from the classic decorative motifs found throughout the Ambassador. The labyrinth is a symbolic archetype that has fascinated people for thousands of years. Petroglyphs and artifacts inscribed with labyrinths that were discovered in Egypt, Greece, and Europe are thought to date from the late Neolithic or Early Bronze Age. Keeley’s Garden, Labyrinth 1 was conceived to provide children with opportunities to express creativity, be contemplative, and have fun. It also provides educators with a unique instructional tool that integrates art with education. 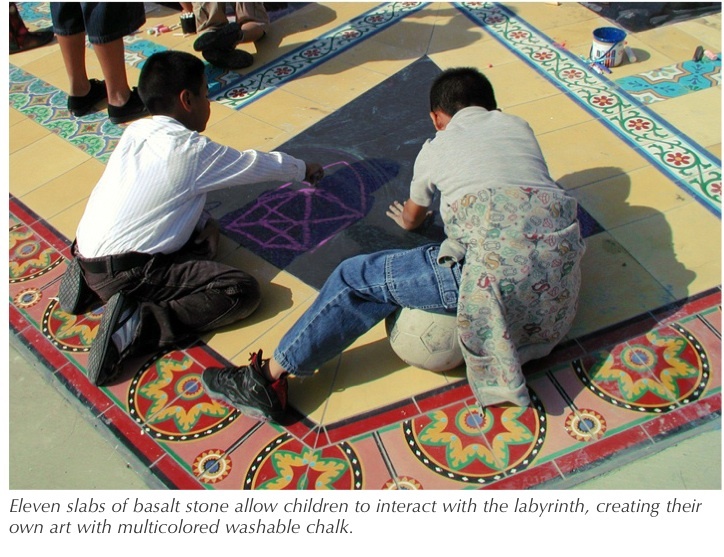 Eleven large slabs of black basalt stone along the labyrinth’s path offer students surfaces on which to create their own chalk artwork, write poetry, or illustrate a sequential lesson in history, literature, and science, using bright washable chalk. The labyrinth’s hexagonal shape provides teachers with a large tactile example of geometry, which may be used to illustrate certain math concepts. Students can walk the labyrinth to absorb and learn from one another’s work. 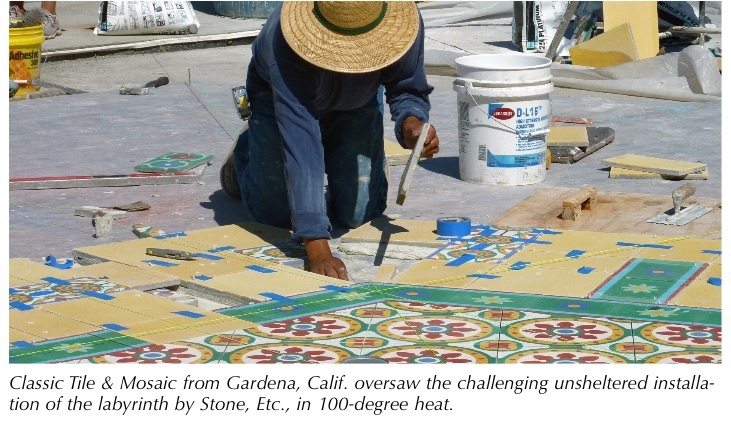 Goodpasture worked with Gardena, Calif.-based Classic Tile & Mosaic (CTM), run by Vincent and Bonnie Cullinan, to supply the tiles, which were made by Original Mission Tile, San Luis Potosi, Mexico, according to Goodpasture’s direction from the original designs in the Ambassador. 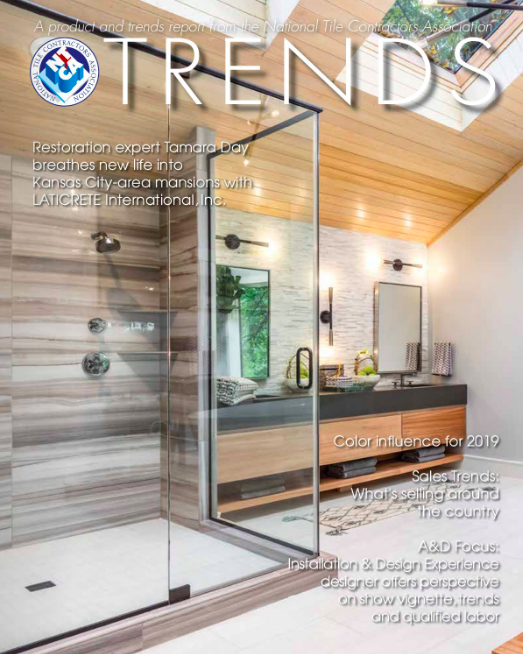 “It was exciting for CTM to collaborate with an artist and through months of preparation to be able to see Lynn’s vision translated through our tile,” said Vincent Cullinan, CTM owner. adjustments, fitted into an irregular recess. Meticulous planning and execution was required to install the 12”x12”, 12”x6”, 6”x6”, and 2”x6” tiles and basalt slabs. The unsheltered exterior installation of approximately 1,500 tiles and 11 heavy slabs of basalt (134 square feet) took place in 100-degree heat, but resulted in a truly unique application of tile and stone, with Goodpasture working with Stone Etc., on the installation every step of the way. 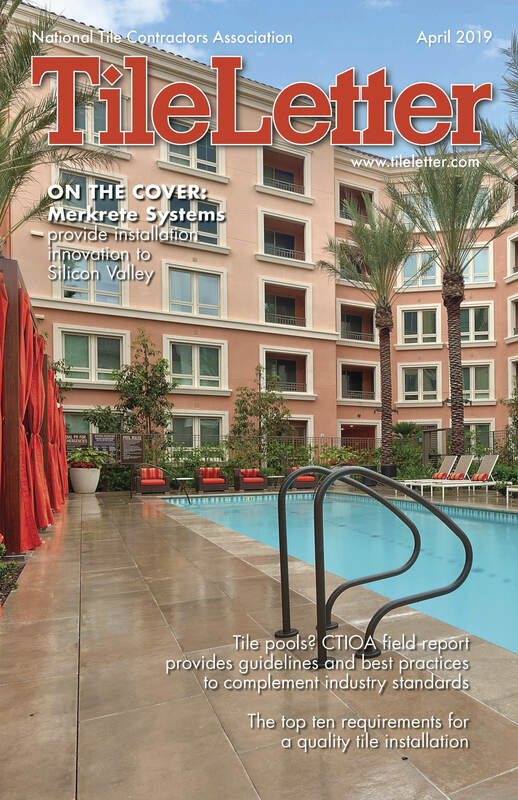 Setting materials provided by Stone Etc., of Gardena, Calif., included 2”x2” 16/16 welded galvanized wire reinforcement, Noble Deck Exterior Thin-Bed Waterproofing & Crack Isolation Membrane, LATICRETE 254 Platinum, followed by Portland Cement Float by Riverside Cement Co., Custom Building Products’ Polyblend Sanded Grout, and Aqua Mix Enrich N Seal. 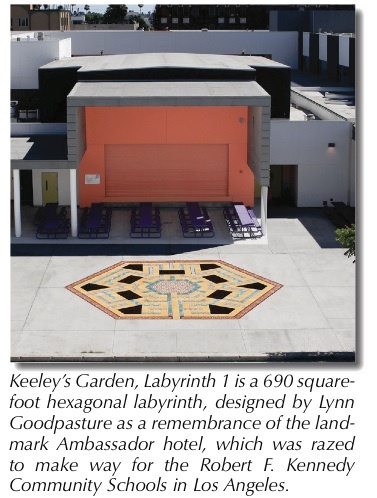 “The labyrinth is a functional piece of art that not only adorns our beautiful RFK campus, but provides an opportunity for kinesthetic learners to explore math and art simultaneously,” said Danny Lo, assistant principal of the UCLA Community School, one of three elementary schools on the RFK campus. 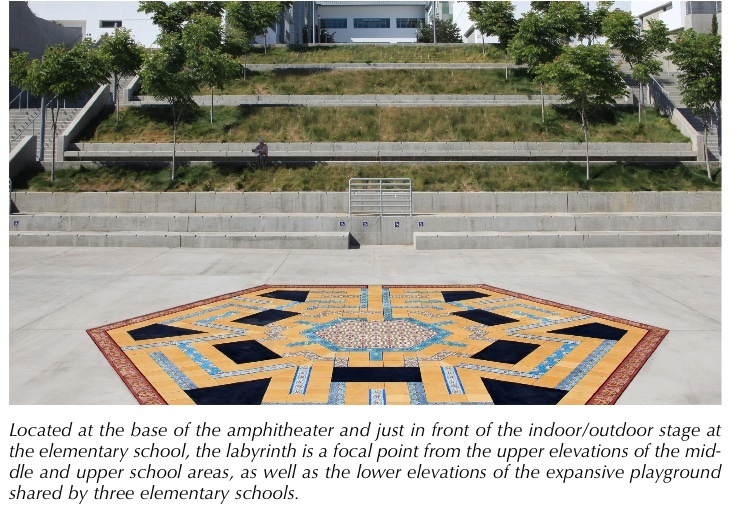 Located at the base of the amphitheater and just in front of the indoor/outdoor stage at the elementary school, the labyrinth is a focal point from the upper elevations of the middle and upper school areas, as well as the lower elevations of the expansive playground shared by three elementary schools. 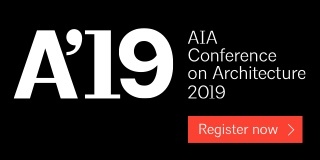 The pure geometry of the hexagonal labyrinth was designed to relate to the clean lines and generous volumes of the architectural environment by Gonzalez Goodale Architects. 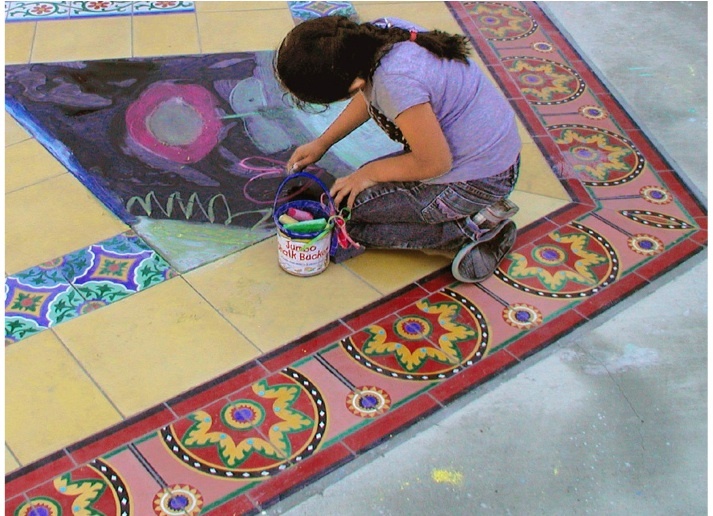 This $99,143.00 original tile installation was designed to inspire students to learn through art that is seamlessly integrated into the built environment. It provides a place for young students to express their own creativity in a public space. The contemplative aspect of the labyrinth also makes it a fitting art form here, given the historical significance of the Ambassador site. Keeley’s Garden, Labyrinth 1 offers endless creative interaction.